Swimming pools can provide years of fun for a family. They are also very labor intensive, costly to maintain, and in many cases they are a liablity when it comes time to sell a home. At Haramut Landscaping, we can remove this burden from your shoulders. 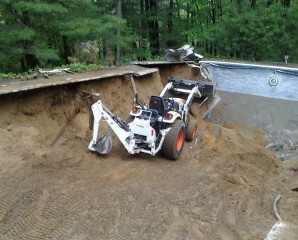 We remove both in ground and above ground pools. In both cases we will repair the area involved and install grass or new plants, which ever you desire. In either case, we are just a phone call away.